Themed around ‘LNG for a Sustainable Energy Future’, the 19th International Conference & Exhibition on Liquefied Natural Gas (LNG2019) had its grand opening at Shanghai World Expo Exhibition & Convention Center on 2 April. ENN, a clean energy provider in China, presented a panorama of its full clean energy value chain at the event. Backed by the world's fastest growing LNG market, the Zhoushan LNG receiving terminal and a strong non-pipeline LNG storage and distribution network, ENN has enabled LNG suppliers at home and abroad to connect with clients, and offer economical, clean, efficient, safe and reliable energy services. 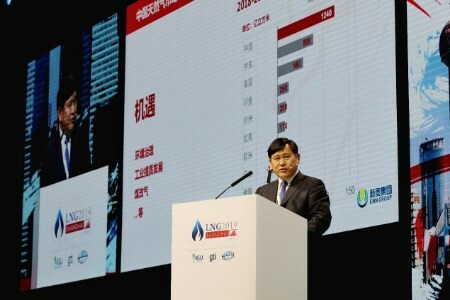 On 4 April, ENN CEO Zhang Yesheng delivered a keynote speech at LNG2019 forum. "The fast growing LNG demand in China is consistently driven by the 'coal to gas' policy, the requirement for quality industrial development and the call for actions to protect blue sky, clear water and clean soil," he said. "For a long period of time in the future, China will be the market with the highest LNG growth in the world." Regarding the increasing reliance of China on LNG imports, Zhang Yesheng responded that the Zhoushan terminal would continually build up its capability of LNG receiving, storage, diversion and LNG bunkering, and align with LNG receiving terminals in Ningbo, Yangshan, Wenzhou and Rudong to form an LNG marine transport network serving the Yangtze River Delta and even the entire east China region. "China is at the centre of global LNG development, and Zhoushan LNG receiving terminal will play an important role to link up the global resources with the Chinese market". In October 2018, the Phase I project of ENN Zhoushan LNG receiving terminal, also the first large-scale LNG receiving terminal invested and operated by a private corporation in China, was completed and put into operation, with annual LNG throughput up to 3 million t. The Phase II project has commenced and is expected to deliver annual LNG throughput of 5 million t in the short-term and 10 million t in the future.